In December 2018 Rob’s father & outback legend - Dusty Miller the Birdsville Baker passed away. 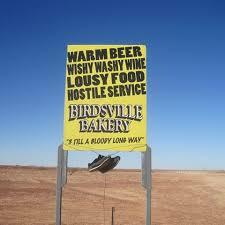 Dusty built the iconic Birdsville Bakery from the ground up in 2004 with a truckload of vision & determination. Situated at the edge of the Simpson Dessert in far western Queensland, the exotic address of 1 Billabong Boulevard, Birdsville always makes me smile. Adventurers drive literally thousands of kilometres to reach this far flung outpost of Australia knowing at the end of the journey they can sample the famous CURRIED CAMEL PIE. Dusty was a great supporter of FEED ME PIZZA with a wealth of knowledge and inspiration in food business and startup. Whenever I need a lesson in perseverance I think of the efforts going into his success 1200km away in the dessert vs ours in downtown Collinswood. So as part of his memorial, to serve at Dusty’s wake, Rob was moved to dash off to Something Wild in the Adelaide Central Markets to see if he could get some of that big feral animal. * To be honest, I thought it was one of Rob’s crazier ideas, and he’s had a few. Up there with taking pizza to a wake at a country property in the Barossa. Well like father, like son, he made it work and even skeptical Chef James was won over to the cause. Curried Camel Pizza is now popular on our gourmet menu. Slow cooked to tender perfection with Afghan inspired Qorma sauce, the CURRIED CAMEL PIZZA is absolutely delicious with tomato, spinach, onion and our famous SMASHED POTATO.